1. 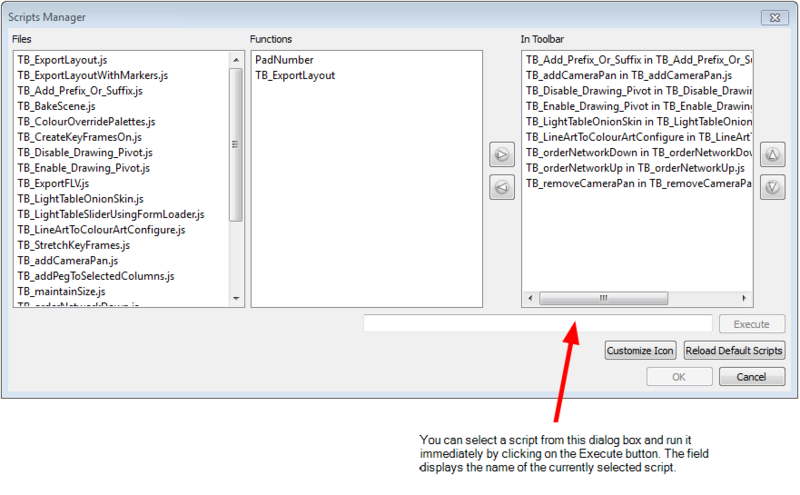 In the Scripting Tools toolbar, click on the Manage Scripts button. A dialog box containing all of the available scripts opens. 3. In the Functions list, select the function to add to the toolbar. 4. Click on the Right Arrow button to add the function to the In Toolbar list—see Toolbar Manager. 5. Click on OK to add the button and close the dialog box. 1. Once the script is added to the Scripting toolbar, you can press on the corresponding script button to execute the action—see Linking a Script to a Toolbar Button. 2. You can press the [Esc] key to interrupt the execution of a script. If you are working in a network environment, refer to the topic Linking a Script to a Toolbar Button.